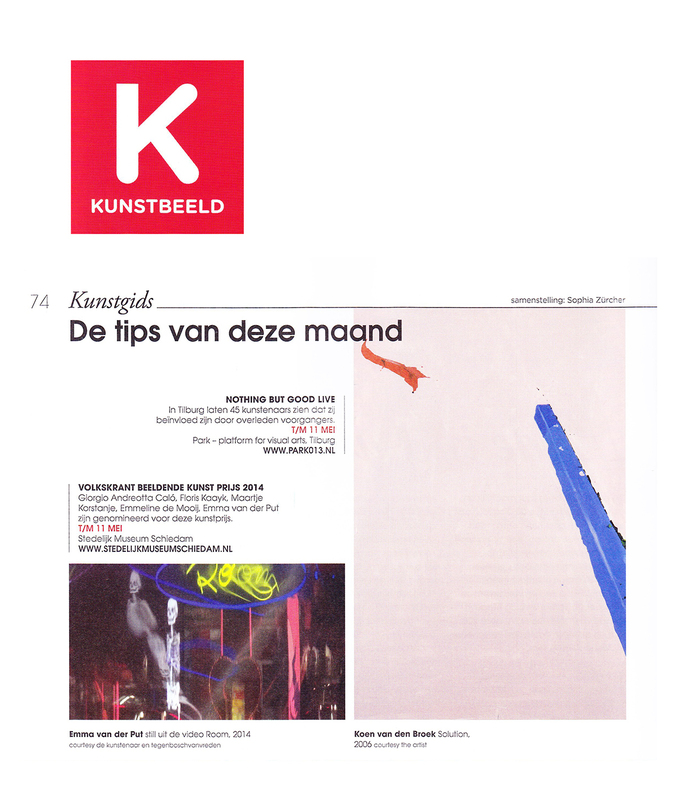 Participating artists: Aart Houtman, Alain Biltereyst, Anthony Cudahy, Arno Kramer, Attila Szűcs, Aquil Copier, Bart Slangen, Bettie van Haaster, Carlos Caballero, Cecilia Vissers, Claudia Kölgen, Elka Oudenampsen, Erin Lawlor, Gideon Rubin, Hans de Bruijn, Henk Duijn, Hernan Ardila Delgado, Jan van de Pavert, Janaina Tschäpe, Johan De Wilde, John Van Oers, Katinka Lampe, Katrien De Blauwer, Koen van den Broek, Lisa Couwenbergh, Linda Arts, Marc Mulders, Martijn Schuppers, Matthew Fisher, Michael de Kok, Mil Ceulemans, Olphaert den Otter, Paul den Hollander, Pere Llobera, René Korten, Reinoud van Vught, Robert Zandvliet, Sarah Verbeek, Seet van Hout, Simon Schrikker, Stefan Peters, T.J. Donovan,Thomas Bogaert, Toon Teeken, Toon Verhoef, Willem Sanders and Yifat Gat. 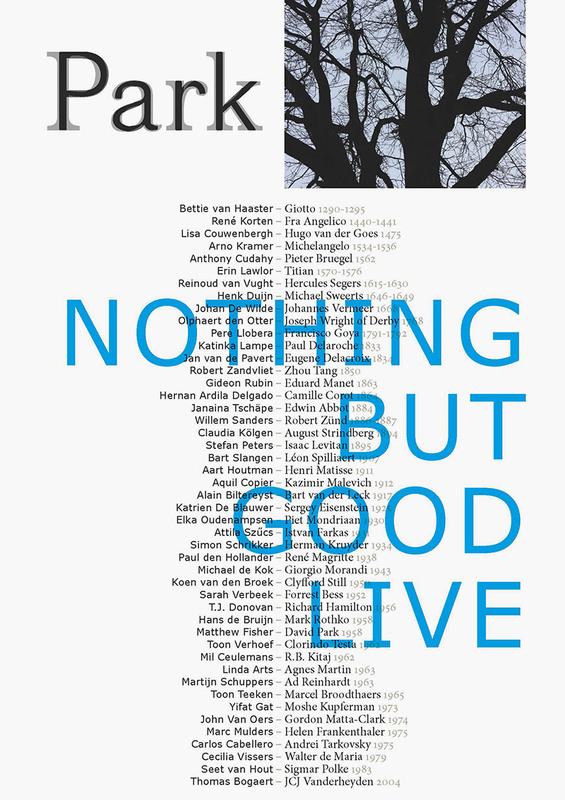 In the exhibition Nothing But Good Live 47 artists from the Netherlands and abroad show that they stand in a tradition. Participating artists from all over the world link themselves with one inspiring predecessor, thereby exposing bloodlines throughout the history of art. Participants understand that they are part of the arts as an organism in constant motion. The exhibition is based on the blog Nothing But Good. It exists since early 2013 and is initiated by Michael de Kok, René Korten and Reinoud van Vught. Invited artists provide a contribution in which they connect with an artist who is no longer alive, but who has had an essential influence on their practice as an artist. Nothing but good should be said of the dead, hence the title of the blog. In this exhibition one work is shown of each artist who made a contribution to the blog up to March 2014. Some of these artists never exhibited in the Netherlands before. The work of the chosen predecessors is shown as a small reproduction in a timeline on the long table in the exhibition space. The opening on Saturday, March 22 at 5 pm is performed by Het Retorisch Kwartet, consisting of Bernadette van Leeuwen (mezzo-soprano), Olphaert den Otter (counter-tenor and participating artist), Henk van Niekerk (tenor) en Peter Hilton (baritone).